These days, it’s not uncommon for employees to spend more time at the office than they do at home, but we’re fortunate here in South Jersey to be surrounded by employers who are doing their part to ensure the hours spent on the clock are completed by happy workers. From offering extra paid time off to extensive benefits packages, from yoga in the office to the option to work remotely, businesses aren’t just trying to promote a better work-life balance—they’re succeeding. Mount Laurel After many years in the banking industry, Gene D’Orazio knows it’s a business where employees don’t stick in one place for very long. But he’s proud to say that’s not the case at Cornerstone Bank, where the average employee has been with the company almost five years. “That’s a long time for a pool of 70 people,” says D’Orazio, the bank’s president. “It’s a fun place to work. We try to keep it family-oriented; everyone feels like this is their second family. That’s the way we operate the bank. We try to make it fun and work hard at the same time.” Cornerstone rewards that loyalty every year with its Employee Recognition Dinner, held this year at Café Aldo Lamberti. Each person who has been with the company at least five, 10 or 15 years is recognized and given a special pin and a gift certificate. There are also raffles for extra PTO days or other prizes, such as an iPad mini. The dinner might be the main event at Cornerstone, but it’s far from the only one. They also have Phillies Fridays, when employees can dress in Phillies gear and ballpark treats are served; they celebrate National Pet Week and encourage employees to display pictures of their pets; and they have an annual bowling party, where employees are divided into teams and compete for a trophy. Cornerstone, which has nine locations in South Jersey, also participates in the South Jersey Fall Heart Walk every year at the urging of a former employee and makes a donation to the American Heart Association. Cooper University Health Care, Headquartered in Camden When it comes to offering countless benefits and a compassionate work environment, Dr. Adrienne Kirby, president and CEO of Cooper University Health Care, says Cooper is committed to offering the best that is out there for its 5,788 employees. “Choosing a career in health care is very rewarding, yet very demanding,” she says. “I think it’s important to provide a working environment that engages the entire team and that recognizes and rewards excellent performance. It is also essential to offer our employees programs and services that help make their daily lives easier to manage.” One of the more unique benefits Cooper offers is a concierge service, based at Camden’s Cooper University Hospital, which provides employees assistance with errands, shopping, entertainment tickets and other tasks. Other benefits include wellness classes, reimbursement for weight loss programs and gym memberships, pet insurance, an on-site health education center, and adoption assistance benefits, along with health benefits, including prescription, vision and dental plans, and a retirement plan with matching contributions. Cooper also has a recognition program where employees can recognize and nominate their peers for their hard work, as well as a points-based recognition system where employees can earn points that can be redeemed for prizes. Brett DiNovi and Associates, Cherry Hill This small, 50-employee agency works in an exclusive industry, providing board-certified behavioral analysis services to schools and households from Middlesex to Cape May County. With children and their families as its customer base, the agency understands how important a fair work-family ratio is. “Even though the benefits we offer are similar to those of large companies, we are still a small, family-oriented business,” says CEO Brett DiNovi. “Families and kids are our highest priorities.” Along with medical, dental and disability benefits, employees of the company, which has a single-digit retention rate, can enroll in an employer-matched 401(k) and receive tuition reimbursement for certification classes. Employees also receive wages above industry standards, are eligible for bonuses, and work flexible schedules. “We can bring our kids to the office if we need to, or work from home if need be, depending on schedules or illnesses. There really is a lot of flexibility,” says Marlene Selfridge, director of human resources and marketing. DiNovi also meets with each of his employees weekly to keep abreast of their caseloads so he knows what’s going on with each client and can answer questions if a parent or school calls regarding a specific case. He also encourages his executive team members to find a section of the industry they enjoy and focus on it. “In our company, everyone seems to find a niche they love, and we are able to carve their position around that,” DiNovi says. Evergreens Retirement Community, Moorestown From the standard medical and dental to tuition reimbursement, free legal reference programs, and discount programs on vision, fitness and weight management, The Evergreens in Moorestown offers a range of benefits to its 231 employees. “Being named one of the Best Places to Work is very meaningful to us,” says Doug Halvorsen, president and CEO of The Evergreens. “We do not offer a lot of the flashy stuff—we just try to be steady and consistent.” Employee satisfaction is reflected in the community’s high retention rate. Halvorsen is proud that The Evergreens’ employee turnover rate remains in the single digits, with many staff members working in the continuing care retirement community for more than 25 years. “Folks love working here,” says Halvorsen. “They respect each other, and they know we try to be fair.” Whatever accommodations are available to The Evergreens’ residents are also made available to the community’s employees—allowing staff members to take advantage of its dining services, indoor pool and putting green, to name a few. Additionally, The Evergreens encourages community involvement among their employees, who participate in community events throughout the year, most recently at Moorestown Day in the beginning of June. The Evergreens also funds scholarships for employees pursuing careers in health care, holds multiple recognition ceremonies throughout the year, throws holiday parties and participates in Take Your Child to Work Day—which includes Zumba class, mini golf, movies and sundae making with parents. Silver Diner, Cherry Hill In 25 years at this local eatery, general manager Jose Reyes has discovered the key to a successful business—happy employees lead to happy customers. That’s one reason he treats his employees like family members and goes out of his way to show them his appreciation. “We do a lot of good things for our associates. It’s not just about work,” Reyes says. “When people get up in the morning, they don’t think, ‘Oh, I have to go to work.’ They’re happy to get up because they know they’re going to get treated like family. And that’s how we get the best out of them, because when you’re happy, you perform better.” Birthdays are a big deal at the Silver Diner, as every employee gets a party on his or her day, complete with a cake and a present. Reyes also throws summer barbecues, and at the annual Christmas party, an Associate of the Year for both the front of the house and back of the house is chosen and awarded a special prize. If that’s not enough motivation, the diner has contests throughout the year and gives $100 gift certificates to employees who sell the most appetizers or desserts in a given month. The restaurant—which can be found in Maryland and Virginia as well as Cherry Hill—also has companywide contests for the highest-selling location. As for managers like Reyes, Silver Diner offers retirement and health plans and such perks as a gym membership or corporate trainer. The Silver Diner can also be a fulfilling place to work because of its efforts in the community. The restaurant provides food for many nonprofit organizations, and holds special “Run the Diner” nights when a percentage of the proceeds goes to local charities. Source4Teachers, Cherry Hill There are two types of employees at this educational staffing company: the full-time staff that makes up the corporate office, and the part-time personnel who are substitutes in the field. Whatever their role with the company, all 6,500 employees receive medical benefits, a 401(k) plan, and an understanding ear from President Kevin Bush. “Employees at any level in the company can walk in, sit down and have a meaningful face-to-face discussion with our president, Kevin Bush,” says Jennifer Mangan, sales and marketing coordinator. The rapidly growing company, which is expected to expand into nearby states in the next few months, also recognizes outstanding staff performance through its Employee of the Month award, and encourages promotion within the company. Substitutes for Source4Teachers are afforded a flexible schedule and can work one day a week or every day of the school year. They are also entered into drawings for gift cards in the spring and around the holidays, from $50 to $500, and offered training throughout the school year so that they are aware of the latest instructional and classroom management techniques, and are prepared for the classroom setting. Source4Teachers is also active in the community, awarding scholarships to local students and participating in causes such as the One Warm Coat drive and the Kidsbridge Walk2Stop Bullying. It also donated items to those individuals, families and schools affected by Superstorm Sandy. Lourdes Health System, Headquartered in Camden Lourdes has a strong presence in South Jersey and is committed to its 3,200 employees and their families. From its emphasis on work-life balance through flexible work schedules and telecommuting options, to its free, on-site health screenings, it is evident Lourdes does what it can to keep its employees happy, healthy and fulfilled. 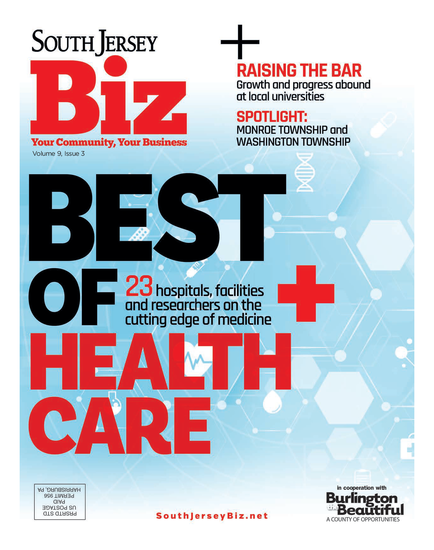 “We are exceedingly proud to be honored as a Best Place to Work by South Jersey Biz magazine. At Lourdes, we believe our business is to provide the highest care through exceptional patient experiences, without exception. Our high-caliber caregivers are the key to our success,” says Alexander J. Hatala, president and CEO of Lourdes Health System. Along with the standard medical and dental packages, Lourdes also offers the employees at its six locations a 403(b) retirement plan with matching contribution, a generous paid personal leave program, tuition reimbursement and discounted fitness programs through the Lourdes Wellness Center and other local gyms. Additionally, Lourdes has a strong associate recognition program, including “years of service” awards and the annual Sister Elizabeth Corry Award, which recognizes employees who exemplify its core values, as well as various other individual, team and leader awards for outstanding work. Published (and copyrighted) in South Jersey Biz, Volume 3, Issue 6 (June, 2013).